Get high quality vinyl bumper stickers for free. You can order your bumper stickers via e-mail, phone, or postal mail. There are many of their stickers shown online! IMPORTANT: When ordering your bumper stickers. Please be sure to include your postal mailing address. There is no charge for bumper stickers. 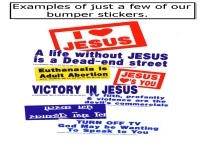 dear brethren, i need christian bumber sticker as a medium for evangelism.